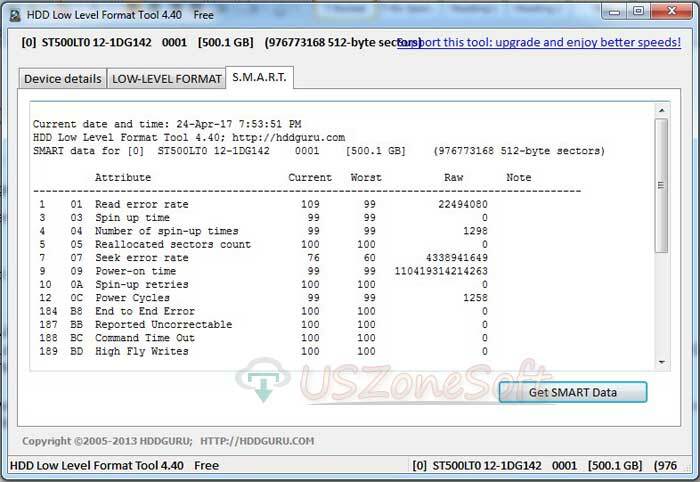 HDD Low Level Format Tool is the best SATA, USB, IDE, SAS, SCSI, SSD like HDD, SD, flash, MMC or card reader fully formatting tools. It's fully freeware program from the publisher by HDDGURU. Using the top quality of special services that the program 100% work on Samsung, Maxtor, Quantum, Hitachi, Sony, Toshiba, Fujitsu, IBM, Seagate, etc and more manufactured company's internal or external drive. With the tools, you can easily to find out all device information such as model name, firmware revision, serial number, a physical parameter, LBA/ LBA48 commands, device capacity, security features, streaming feature, command queuing and maximum queue depth etc. Its S.M.A.R.T is the more powerful way to get smart data for your HDD full Attribute such as the option Read error rate, Spin up time, Number of spin-up times, Reallocated sectors count, Seek error rate, Power-on time, Spin-up retries, Power Cycles, End to End Error, Reported Uncorrectable, Command Time Out, High Fly Writes, Airflow Temperature, Power-off retract count, Load/unload cycle count, HDA Temperature, Current pending sectors, Offline scan UNC sectors, Ultra ATA CRC Error Rate etc.